Much of the pre-season discourse surrounding Newcastle United has been about budgets, transfer targets and then failing to get said transfer targets over the line courtesy of budgetary issues yet it wasn’t until the action on the pitch began that you realised just how difficult a season the Magpies are facing. In Sunday’s 1-0 defeat to Huddersfield Town the visitors looked bereft of both quality and spirit with David Wagner’s side barely being tested once they took the lead through Aaron Mooy. Newcastle’s inability to hurt a team that finished below them in the Championship last term was highlighted further by the lack of impact the changes Rafa Benitez made had. Newcastle’s bench wasn’t strong enough and the players who came on were much of a muchness in comparison to those who were being replaced. Joselu, Mohamed Diame and Jacob Murphy were all brought on to rescue a point and it was only really the Spaniard who had any real impact on the match and even then it was minimal. It was an important point to raise after the match that Benitez was turning to players who either had very little Premier League experience or those who had never really reached any level higher than battling relegation in that division. Joselu had next to no impact at Stoke and was loaned to Deportivo La Coruna for the 2016/17 campaign. With money tight and a deal for Lucas Perez seemingly too difficult, Newcastle United opted to sign Joselu for £5 million earlier this summer yet he is never going to get you the goals needed to stay in the English top flight. 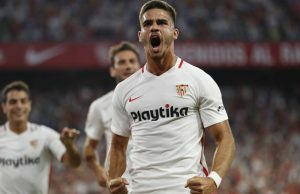 Never in all his time as a striker in professional football has the Spaniard netted over ten league goals in a season aside from two seasons with Real Madrid B. You can’t rely on Joselu to score goals, his record suggests that, so having him on the bench to try and save a game is never going to work irrespective of his technical ability. There just wasn’t a lot of fight in Newcastle’s performance on Sunday and of course this is an intangible that you can’t accurately measure but it was just a feeling they gave off. It was almost as if the negativity coming from behind the scenes with regards to the transfer window had seeped into the mindset of the players. Now take nothing away from Huddersfield who, buoyed by an exuberant home crowd, were excellent on the day and you need look no further than their own transfer business for inspiration. Aaron Mooy was with the club last term but it was clear at that point that he was a lot better than Championship level whilst Steve Mounie arrived as a relative unknown to the Premier League but he is a strong, physical centre-forward who can act as a reference point for a team and he also netted 14 Ligue 1 goals in a very average Montpellier team last season. Those are the kind of astute signings that give you a chance in the Premier League, especially when for a lot of matches you will be under pressure. You need a forward who can take a chance when it comes and you also need the ball to stick to him in midfield once you actually clear your lines. Newcastle United do not have that sort of player and whilst the club continues their policy of looking for value in a difficult market then they won’t get such a player either. £12 million for Perez looks a bargain, especially if Deportivo manage to sign him back for that amount, with his debut season at Arsenal showing flashes of ability and brilliance and it was actually poor managerial treatment which is ending his career in North London rather than a lack of quality. You look at how he played at Arsenal and it is difficult to envisage him being anything other than a huge improvement on Benitez’s current options in attack. You worry that Mike Ashley’s desire to stay frugal in the transfer market may end up the costing more money with a second relegation in three years. Newcastle’s relegation in 2009 was interesting in the sense that they didn’t lose many of their star players and they didn’t bring too many players in either. Jose Enrique, Joey Barton, Wayne Routledge, Jonas Gutierrez and Kevin Nolan all stayed at the club for the season in the Championship. Now of course these were the players that were culpable in the aforementioned relegation but it ensured that when the club were promoted at the first time of asking they had Premier League players, albeit lesser quality ones, who understood the division and had some qualities that suited playing in it. In 2016 the turnover of players was far greater with Andros Townsend, Georginio Wijnaldum, Remy Cabella, Daryl Janmaat, Moussa Sissoko and Cheick Tiote all leaving the club at that time. In terms of signings a lot of players were brought in to suit Championship level with Isaac Hayden, Grant Hanley, Ciaran Clark, Daryl Murphy, Dwight Gayle and Matt Ritchie all joining. Now for the 2016/17 season these players were a success with the former Liverpool coach guiding the Magpies to the title, albeit not as comfortably as many expected. Unfortunately the vast majority of this squad remains first-choice in the Premier League and the gulf in requisite quality between the two divisions is huge. Sunday’s starting line-up featured just two players who weren’t at the club last term, Javier Manquillo and Mikel Merino. Manquillo never looked comfortable in the Premier League throughout his time at Sunderland whilst Merino is still very raw in terms of his talent and has never played in such a physical environment. It’s clear to see that the business Newcastle United has done thus far this summer isn’t enough and Sunday was the perfect illustration given how far behind Huddersfield they were in every department. Huddersfield being a team that came up with them and are also expected to be in a battle to avoid relegation is another concern as they already have six points whilst the St. James’ Park club has none. There are still around two weeks left for transfers to be completed before the window shuts and you would imagine Newcastle will be heavily involved; but three matches into the season the warning signs are glaringly obvious as their team is not strong enough in quality and the players are not playing with the necessary belief and fight to make things difficult for their opponents. Rafa Benitez cut a frustrated figure on Sunday and he hasn’t been shy in making his feelings known this summer. Whilst he remains a cult figure at Newcastle after his excellent work with the club already you do worry that he will soon replace Antonio Conte as the bookies’ favourite to be the first managerial departure this term and if things don’t go his way before August 31 you wonder if he may be on his way sooner rather than later. ← Previous Story West Brom: Can the Baggies win a trophy this year? Next Story → Should release clauses be mandatory in English football?